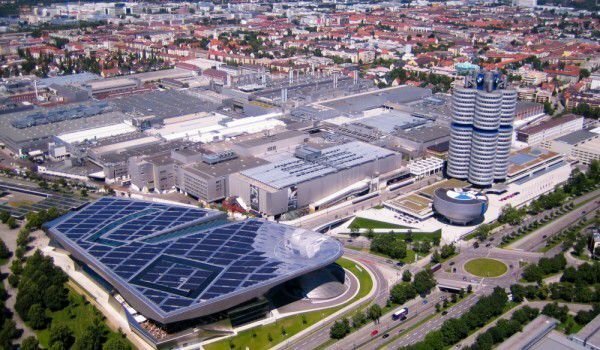 With a population of nearly 1.5 million inhabitants, Munich is the largest city in Southeast German State of Bavaria and the third largest settlement in the whole of Germany, after Berlin and Hamburg. Munich is located on an area of 310.43 square kilometers, Having river Isar run through the city. Lying in the heart of the Bavarian countryside Munich is at the foot of the Bavarian Alps. Popularity of the city comes from the notorious Oktoberfest , which is the largest brewer fiesta in the world that attracts annually around six million visitors to the city. 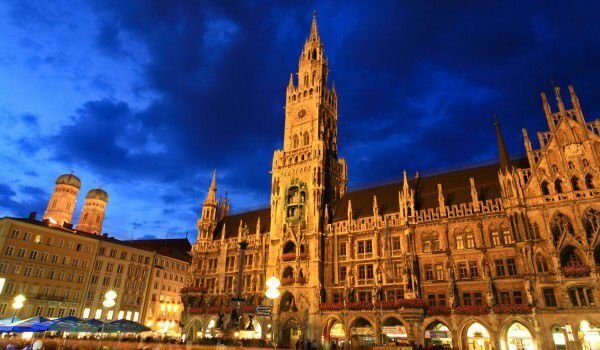 Today Munich enchants with its incredible cozy and warm urban atmosphere that is accentuated by the authentic historic buildings, theaters, museums, palaces and religious shrines. Large and small cafes and bars complement the charm of Munich with a hint of noisy nightlife. The name of the town comes from the old German word Mönche, meaning "Monks". The name of the town comes from the Benedictine Order of monks, who founded the village. Today the town crest depicts a monk, holding in his left hand the Bible. The official colors of Munich are black and gold since the reign of Ludwig the Bavarian. It also has colors from the Holy Roman Empire. 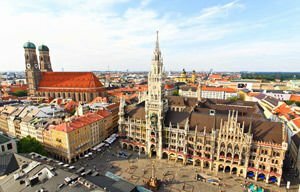 Munich exists with this name from 1158, and the founder of the settlement is Heinrich der Leuven (Henry the Lion), Duke of Bavaria and Saxony. After half a century Munich received city status and was fortified. In 1327 the town was completely burned and later rebuilt by Ludwig IV. In 1632 and during the 30 Years War the city fell under the control of the Swedish King Gustav II Adolf, and in 1705 it was again captured and returned to the Habsburgs. The first school in town, the Bavarian Academy of Sciences, was founded in 1759 in 1826 in Munich opens the door of another prestigious university - Landshut University. Among the sights of Munich are the old and new Pinacoteca of Modern Art. Old Pinacoteca impresses with its brick facade that was built in Venetian Renaissance style. This is a real architectural treasure built in the early 19th century to house the private collection of art works by Ludwig I. Today in this museum you can see paintings by old masters and masterpieces of early Northern Renaissance. Having recently been revamped, the Old Pinacoteca at Munich in class has its only rival as the Louvre. Here you can see the Madonna with the infant, by the young Leonardo da Vinci , the crowning with a crown of thorns by Titian, Four Apostles - the last work of Albrecht Durer, and works of Hans Memling, Pieter Bruegel the Elder, Frans Hals and others. The art Gallery boasts one of the richest collections of Flemish painter of the 17th century Peter Paul Rubens, presented here with 62 of his canvases. Particular attention should be paid two of his paintings – the great Judgement and a Self-portrait with Isabella Brant. Other famous buildings in Munich are the Frauenkirche (Cathedral "St. Mary") and the Olympic Tower, radio and television facility in the former Olympic village. Frauenkirche is one of the most impressive buildings in the center. Immediately recognizable by its two towers - one slightly taller than the other. In 1972 was built the car giant BMW’s museum with its oval. Munich has a long tradition in football. As already centuries-old tradition in late September in Munich starts the biggest beer festival in the world - Oktoberfest. Each year at this time, Munich gathers around six million visitors and admirers of mugs that are everywhere here, distinguished by their size and content, which is dominated by local German beer- Vazen. This type of liquid hop is well- known, it is quite strong, as it is produced by master brewers from here. Traditional one-liter mugs bear the name mass. This noisy beer procession lasts from September to October each year from 1810 onwards. Then, on October 12, opens the first Oktoberfest, dedicated to the wedding of Prince Ludwig of Bavaria to Princess Theresa von Sachsen-Hildburghausen. In that case all the citizens of Munich were invited to the lawn in front of city tower to drink a glass or two for the health of the Imperial honeymooners and since then the tradition is observed each year. Sometime during Oktoberfest in Munich is marked the turf of the meadows around the town. Beginning of Oktoberfest as it is celebrated today (with tons of beer ) was launched in 1896 when local businessman working with locals brewers, stretched large tents and held the early beer fiesta. Today, Oktoberfest attracts millions of tourists from around the world who flock to Munich especially for the event - to drink beer and listen to traditional Bavarian music. For nearly a month in Munich at that time, people drink more than 6-7 million liter mugs of beer and along with the beer eat around 400, 000 tons of sausages, 650, 000 chickens, and over 90 oxen. The remaining beer “sides” are limited to tons of sour cabbage and macaroni and cheese.